I wish this app included product names & item #’s. I also would like to see a pick list (with names) of the free gift items (for PC Rewards & new Consultant free products). Monthly campaigns would also be a great addition. Aside from that, I appreciate the convenience. This app has made running my business so much easier! I can calculate, send, and save each transaction effortlessly. When our company makes changes, within a short time the app is updated and it’s business as usual. 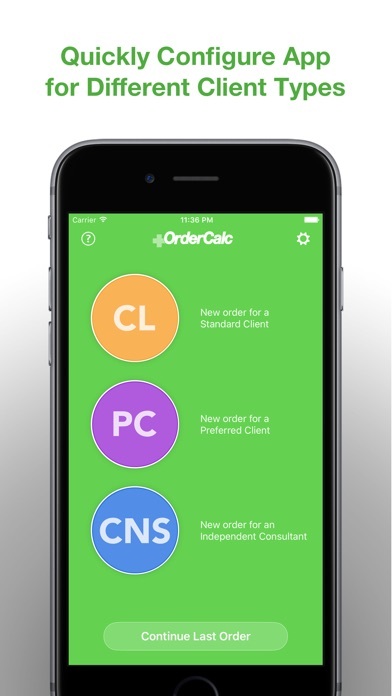 I cannot recommend this app enough for anyone who calculates orders for clients. Thank you, thank you, thank you! This tool is a must-have when running your Arbonne business! I love how quickly it calculates my orders with tax, shipping, discounts, etc. I especially love being able to email someone their receipt! I recommend this for all consultants!! Very handy way to figure pricing quickly when out and about or at events! Love this app but pleas update to include the new success packs and special value packs!! Very easy to use and helps with orders! This app is perfect for one on one meetings! Or talking to someone about an order and they are trying to figure out all the price points. Very simple to use and will help you make more money, because you have the answers at your fingers! Brian, Thanks so much for the latest update to change the shipping percentage!! I will definitely recommend to all of my thirty-one sisters!!! Just a couple things I wish to make it perfect! First, when you have a discount, it should do the taxes off the discounted price! I'm having to auto adjust it :( also, it would be awesome if I could key in items and have it pull the amounts! Then I would know it's the right amounts! This app has been a life-saver at my shows. We just need the new lifting and contouring ASVP added in and then it would be perfect! This is such a helpful app. I am very happy with the upgrades. Must have for all consultants. I love this app!!! Thank you so much for creating it. The only suggestion I have would be to add in something to calculate if they become a PC or Consultant. I think this will be so useful at presentations! I love this app!! It has been a very much needed tool for my team and I! Zero calculation mistakes now! Only request is we need the update ASAP for the new ASVP's including the new Re9 Contouring day and eye cream. Thanks!! Loving this app! There have been updates to the Arbonne rewards, will you be updating the Ap to reflect these changes? Now that the rewards are $125 for $25 and so on?!? Love new changes, 1 more things is needed. I love the changes!!! However, there still could be an improvement. This app definitely helps with adding amounts and calculating everything but personally it would help to type in either choose from a saved list of product or have the ability to type it in next to the charged amount. That way we can send an email receipt and it already has the products and amounts on there. And it can help us stay more organized! I love the new changes though. Thank you! This app makes it easy to show best value the client and is a huge time saver at workshop/parties/events. Oh my goodness! What an amazing gift you have given us! This is incredible and my whole team is downloading it like CRAZY!!!! 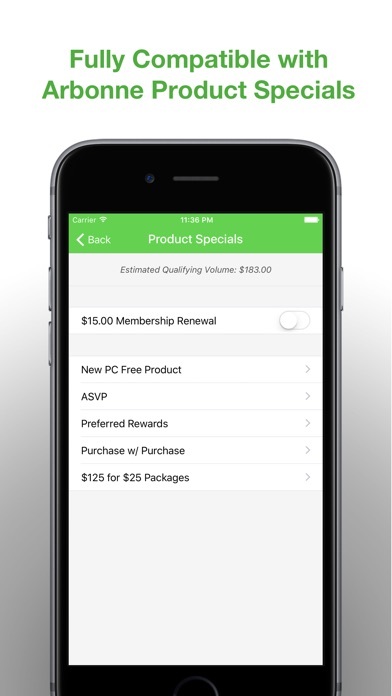 This app is great for playing with discounts to help get your clients the best deals around! With a swipe compare preferred to retail to consultant pricing! You can apply preferred rewards, and $125 for $25 discounts. The app isn't a shopping cart, so keep a list of product prices on hand to reference and enter into the app. As an independent consultant, parties can be busy and you want to get out of there as soon as possible (perk of the job!) This app allows you to get your orders added up with any and all extras in a few seconds. AMAZING! I also love that I can email the receipts too...so convenient!!! ; ) I recommend to all Arbonne consultants! My Area Manager told me about this application and it sure makes life easier. Eliminate your calculator. Does everything for you. I love this app! It makes for a great business tool and I'm so happy I ran across it! Thank you for creating! One question though... Is there a way to do consolidated shipping between all the guests? Or do I need to manually override the amount in that section? I would have given this app a 5 previously but without updates for ASVPs I will give it a 2. Please update! Thanks for working to keep updated with the new changes! The developers tend to be quick with this but I'm writing this review to remind them just in case it hasn't come to their attention that there are several new changes as of June we need updates for. (Mainly for preferred client orders!) Please help and thank you so much! Previous review: This is a handy app and must-have for consultants! I love the ability to have this app on hand at events, out and about, or even to send a screenshot to a client while discussing an order over the phone. While I usually aim to give an official order form to clients right away, it is handy to be able to send a receipt right from the app. It also helps clients understand the various discounts, makes it easier for them to see why upgrading to PC for example makes sense, gives a professional impression, and takes the stress off calculating the many benefits offered to clients and hosts. Thank you to the developers for continuing to add updates with all the recent changes!! Please update this app. It is almost entirely useless as of 9/1/14 now that there are no longer packages for RSVP or UVP. This app does not support the 5 new ASVPs. I refer to myself as not good at doing math and I have to say this app had really, really helped me at my parties. It's so easy to quickly show clients what they will save to sign up as a PC or IC. So wonderful to have! Not a waste of space at all!! Love it! This is an ingenious tool! The price for the app is less than the price of a calculator. Makes check-outs quick and easy! Love it!! Thank you!!!! This app has been such a huge help for my business! It makes it so easy to quickly calculate order with all the different offers. Just as a heads up to developers... many new changes were introduced from Arbonne headquarters yesterday! Time for another update!